I love eating raw fish so, of course, I love tuna tartare and tuna ceviche. 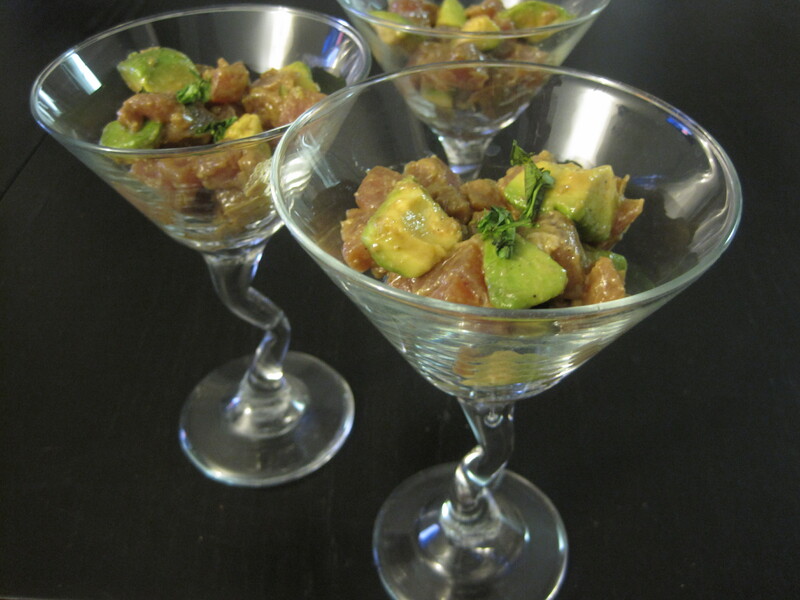 I’ve posted my two favourite versions of tuna ceviche / tartare below. Tartare is a dish where raw fish or meat has been cut into small pieces and can be lightly seasoned. Ceviche is a dish where raw fish or seafood has been cut into small pieces and “cooked” or marinated in lime or lemon juice. These are really simple to make and are perfect for parties, because you can be creative with the presentation. For example, you could serve these in spoons, martini glasses, or wonton cups (recipe below). Also, you could make towers using round cookie cutters or ring molds and serve them on top of salad to make a very impressive appetizer. Mix the sesame oil, soy sauce, lime juice, garlic powder, pinch of coarse salt and pepper, and red pepper flakes if using, together in a non-metal bowl. Then add the tuna and mix gently until well combined. Add the avocado and mix gently. Then cover and let sit in the refrigerator for at least 1 hour. Give everything a gentle mix before serving. I like to serve this in martini glasses. Serve with tostadas, tortilla chips, pita chips, crackers, or rice crackers. Or, you could serve these in wonton cups (recipe below). Mix the lime juice, garlic powder, a pinch of black pepper and a large pinch of coarse salt together in a non-metal bowl. Then add the tuna and mix gently until well combined. Add the mango, red onion, cilantro and avocado if using, and mix gently. Then cover and let sit in the refrigerator for at least 1 hour. Give everything a gentle mix before serving. I like to serve this in martini glasses. Serve with tostadas, tortilla chips, pita chips, crackers, or rice crackers. Or, you could serve these in wonton cups (recipe below). For wonton cups, you can have two different looks: one where you use the square wonton wrappers as they are and another where you use a round cookie cutter to make the wonton wrappers round. Both look good but I find that French inspired fillings or creamy fillings (ie. goat cheese or cream cheese filling) look better in the round wonton cups whereas meaty fillings or salads (ie. shrimp salad or tartare) look better in the square wonton cups. Put wonton wrappers into a dark coloured, non stick mini muffin tray (one wrapper per cup). Note that there is no need to brush the wrappers with oil. Bake at 350 F for 7 to 9 minutes. Wonton cups will be lightly golden in colour and crunchy. Cool on a rack and then spoon in your filling of choice. For the fillings I like to use crab meat salad, shrimp salad, tuna tartare, etc. Thanks so much for commenting, Mark 🙂 I thought about you when I wrote that post 🙂 Let me know how it works out for you! Thank you so much for your comment 🙂 I really appreciate it. Have a great weekend!